Place chicken breasts on a flat surface and pound to uniform thickness. Whisk together coconut aminos, ginger, 1/4 cup olive oil, fish sauce, sesame oil, sriracha, and salt. Measure out 3 tablespoons and set the rest aside. Rub the 3 tablespoons into the chicken breasts on both sides. Place the chicken breasts in a zip-top bag, squeeze out air, and seal. Refrigerate and let marinate for 3 hours to overnight. Add the red wine vinegar and chopped green onions to the reserved ginger mixture, whisking until smooth to create a vinaigrette. Refrigerate the vinaigrette until ready to serve. 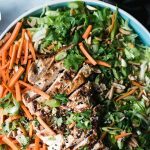 Combine the sliced cabbage, carrots, sliced green onions, cilantro, slivered almonds, and sesame seeds in a large bowl. Toss with vinaigrette. Once the chicken is done marinating, heat 2 teaspoons of olive oil in a skillet over medium-high heat. Add the chicken breasts and cook for 4-5 minutes per side, until cooked through. Transfer to a cutting board. Let rest for at least 5 minutes before slicing into strips. Separate the slaw into 4 equal portions. Top each portion with half a chicken breast.